It had been billed as an away day to thrash out Labour's policy on Brexit - a kind of shadow of the Chequers gathering. In the end when Labour's Brexit sub-committee met this week, it wasn't "away" from Westminster and it wasn't a day. A paper was tabled but not formally endorsed. But I'm told that nuances have been ironed out and it has all but got the approval of the party leadership. It will form the basis of Jeremy Corbyn's Brexit speech on Monday. What is he likely to say? Labour insiders favour the word "evolution" to describe any change. Contrary to speculation, there won't be a seismic shift in policy but it will move forward. In the summer, under pressure from some of his MPs, unions and his shadow Brexit secretary Mr Corbyn signed up to a policy of staying both in the single market and the customs union for any "transitional" period after Brexit. The Labour position has been to argue that "a" customs union was "a viable option" and that the government should "keep all options open". What we are likely to see on Monday is wording that makes plain that "a" not "the" customs union would have distinct benefits and is the most logical way to solve the thorny issue of the Irish border. It won't just be a viable option but a viable end point. And the policy is likely to evolve in another way too. Currently Labour recognises that when we are out of the EU, we are out of the single market. So it is arguing that it wants to retain the same benefits as single market membership - such as tariff-free trade. I'm told the same formulation could be applied to "a" customs union, that in the long term a future Labour government could sign up to one, if the UK got the exact same benefits as it gets from "the" customs union - frictionless trade and a say over the external tariff on imported goods. As Labour has talked about the benefits of some form of customs union before, this would be an incremental not dramatic move forward. However party insiders say that Jeremy Corbyn can't guarantee that a future Labour government would definitely be in such a customs union because it would have to be negotiated with the EU. But one insider said that people listening on Monday will have no doubt where Labour is headed: That a customs union is the preferred option. Speaking on LBC radio, Shadow Foreign Secretary Emily Thornberry gave credence to this by saying: "We have to negotiate a new agreement. That, we think, is likely to be a customs union that will look pretty much like the current customs union." While this would give the UK the current customs union's benefits, it would also have to take the burdens - including severe limitations on negotiating new non-EU trade deals. 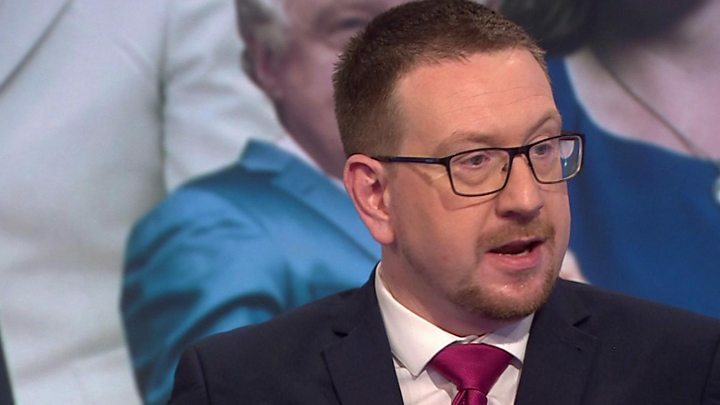 However one Labour strategist warned that when it comes to Brexit policy, there are "many trees in the forest". The customs union may rise like a redwood in the forthcoming Corbyn speech, but it's worth looking at what else is growing and developing at the same time. 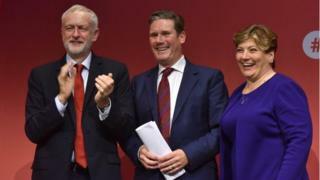 If Shadow Brexit Secretary Sir Keir Starmer is to be happy with the evolving policy - and I'm told he is - there will have to be words about how close the UK should stick to the EU economically and socially in order to get some of the benefits of the single market. So expect Mr Corbyn to re-emphasise that he would not undercut EU standards. Image caption Labour has said it will accept the end of free movement after any "transitional period"
Diane Abbott this week gave more detail on what Labour meant by a "jobs first" Brexit saying: "Immigration is subordinate to our priorities which favour growth, jobs and prosperity." In the past, Labour spokespeople have said they will accept the end of free movement when the transitional period finishes, but phrases such as "easy movement" have been bandied about - possibly an agreement that citizens could move between the UK and EU with minimum red tape to take up job offers, but not simply to look for work. Although a majority of Labour voters opposed Brexit, a significant minority backed it and so far the party's ambiguity doesn't seem to have dented its position in the polls. So why give more clarity? For some, it is driven primarily by politics not economics. There was speculation that Labour might unequivocally commit to the customs union in order to inflict a government defeat - with Tory rebels' help - in the forthcoming trade and customs bill. While about 50 Labour MPs would vote to stay in "the" customs union, most so far haven't upset their leadership and have abstained when the issue has come up. Image caption Are some Labour figures aiming to vote down any Brexit deal and destabilise the PM? While a handful of Brexit-supporting Labour MPs would back the government, if the party leadership signalled to MPs to vote against it because Labour was now more sympathetic to a customs union as an end point, then Theresa May would be in danger of losing. For some Labour figures, the real aim of the "evolution" in Labour's policy is to prepare the ground for a much bigger issue. It is to create enough space between the government and opposition to allow Labour to credibly to vote down any deal that Theresa May brings back from Brussels and destabilise her in the process. So if she clings on, Labour will make her "own" any Brexit fallout. If she is toppled, they would call for an election. But to get there, Labour has to be clearer on the policy divide - and now we are seeing that open up, slowly, before our eyes.